Whole30 Tuna: 3 Compliant Brands & Creative Tuna Recipes! We’re always on the lookout for simplicity and ease when it comes to Whole30. Meal-prepping and recipe-searching can be so overwhelming, sometimes all you want to do is have something to eat, fast. That’s where canned tuna comes in. Tuna is the ultimate emergency food. It’s easily packaged in a can so there’s virtually no prep to be had and it is packed with healthy proteins and fats that will keep you full and your tummy happy. Tuna is awesome because it’s high in Omega-3s, minerals like iodine and selenium, and vitamins like A, B6 and folic acid. Should I Be Worried About Mercury? Unfortunately, tuna gets a bad reputation because of its association with mercury and the health concerns from exposure to heavy metals. Luckily, you can minimize the risk simply by knowing which breeds are least affected. When looking for tuna, keep an eye out for yellowfin and albacore, as these are generally the breeds that, when tested, are reported to have the lowest mercury levels. While it’s not recommended to eat tuna more than a couple times a week, being mindful of which types of tuna you buy is a great step to take to reducing mercury exposure. Other Than Mercury…What Should I Look For? Once you work through which type of tuna you want to buy, it’s time to nail down the label-reading part of the process. Canned tuna, like any other canned food, often has additives tucked away in the ingredient list that are not so Whole30-friendly. The main culprits to look for are soy, monosodium glutamate (MSG), and banned oils like vegetable or soybean oil. 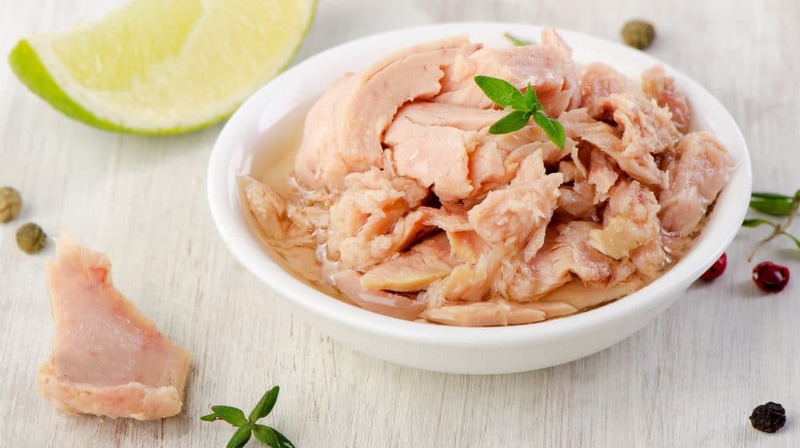 Many canned tuna varieties are packed in oils to give them extra flavor and fat content. It’s important when browsing canned tuna varieties to either make sure your tuna is packed in water or Whole30-compliant oil, such as olive oil. Safe Catch Tuna. This brand is Whole30’s official canned tuna recommendation because not only are all of the ingredients compliant, but it also has the lowest mercury levels of any tuna on the market and is fished using sustainable practices. Awesome! Trader Joe’s Albacore Tuna in Water.This canned tuna only contains tuna and water and is easily found at your nearest Trader Joe’s as well as online. When doing a Whole30, sometimes simple is best! Wild Planet Wild Albacore. This brand comes in BPA free cans, is sustainably caught, and its only ingredients are tuna and sea salt. Tuna salad can be as simple as emptying a can of tuna into a bowl and mixing with some salt, pepper, and your favorite Whole30 mayo and spooning it into romaine leaves for an easy lunch. If you have leftover fresh herbs from another recipe, chopping them up and throwing them in your tuna salad is a great way to make sure they don’t go to waste! Spice things up with these Spicy Tuna Cakes from Nom Nom Paleo! Who doesn’t love avocado? Pair Whole30 favorites tuna and avocado together for a simple twist on a tuna cake with 4 Ingredient Tuna Avocado Cakes from Rachel Mansfield. Feel very European with this Whole30 twist on a classic French salad from Tastes of Lizzy T.
Is canned tuna your Whole30 savior food? What’s your favorite way to mix it up? Let us know in the comments below!